Saturated by images of inundated New York – via the instagram storm and elsewhere – we wonder how the city’s subways and various other low-lying crevices will be drained of Sandy’s remnant flood waters and how long that process might take. As it turns out, there is an emerging design specialty just for that purpose being pioneered by the U.S. Army Corps’ National Unwatering SWAT Team. 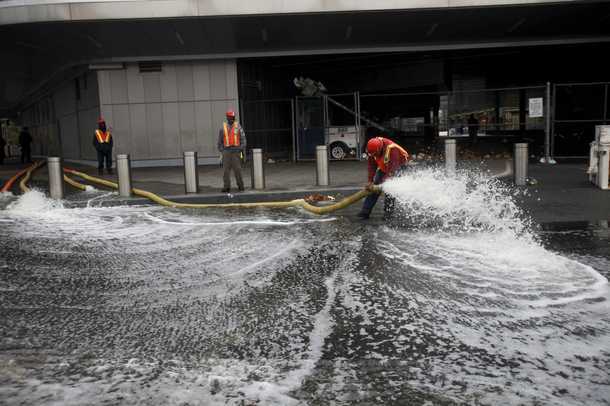 From gleaning current headlines we’ve learned that members of the unwatering team are currently in NY to advise and assist other agencies in removing copious amounts of the metropolis’ unwanted water. This is the team’s first deployment outside of Louisiana, where it acquired its unique skill set. As explained by The USACE, the SWAT team was first assembled and deployed in New Orleans to manage the flooded aftermath of Katrina. In the field equipment consists of “trailer-mounted trash pumps with discharge pipes 8 to 16 inches in diameter” and “engine-driven self-priming pumps that can pass water and even golf ball-sized debris …if the task is too big, they can resort to less mobile pumps with discharge pipes ranging from 16 to 40 inches. The size of the pump depends on the scale of the problem” (via the Atlantic Wire). As unique urban dredging project, once the water is pumped out of where it isn’t supposed to be, overland routes must then be charted to convey that water and miscellaneous detritus through lengths of pipe back into the NY/NJ harbor. Challenging work. As part of that effort, is the tactical SWAT team keeping records of their unique and purposeful interactions with these flood waters? As they observe the flow and pooling of water in Manhattan and harder hit outer boroughs, those labyrinthian topographies of twisted planes of asphalt and concrete, imperfect cracks, sewer openings, stairwells, etc., do they have the opportunity to document ‘post occupancy’ evaluations; meaning are they noting where water congregated (and where it didn’t), how the water got there and the path they used to direct it back out? Do they retain all those civil engineering drawings and sewer diagrams that they decoded and tactically breached? We ask as the current work of the unwatering team and associated agencies, if well documented, presents an opportunity to retrofit the semi-aqueous edges of the city, tailored exactly to what it physically is now. Not to speak flippantly of the disaster and hardship this has been for the metropolis and elsewhere, nor to overlook that Sandy could be an exceptional 200-500 yr storm event. The intent is quote the opposite. We know the city’s edges were underwater prior to being filled in, and all contemporary climate trajectories indicate that they are going to go back underwater more often. 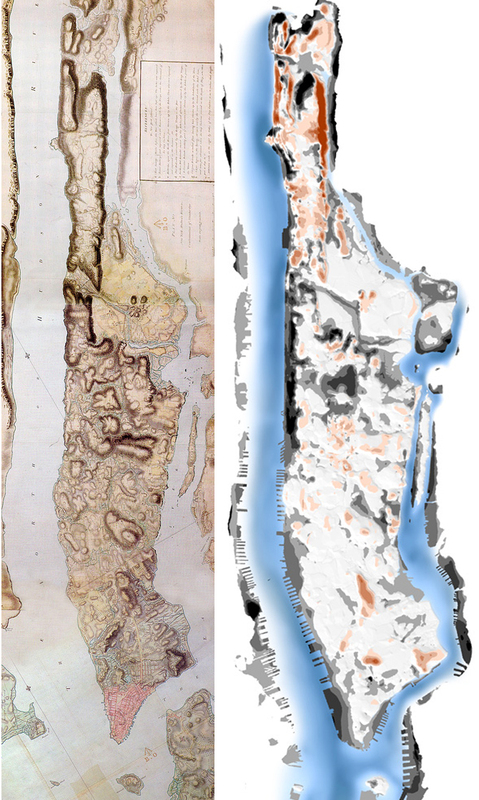 So in conjunction with looking at redesigning the NY/NJ coastline outward with hard or soft infrastructure, how could we intentionally integrate water flux into the city informed by spatially explicit data and intimacy of its edge’s fabric? As a start, perhaps the city could extend the deadline on its current Change the Course of Waterfront Construction competition to get their money’s worth. Alter the brief to make all participants respond to updated FEMA flood maps, disaster struck areas and forensic findings of the unwatering SWAT team. And rather than just the waterfront as single string of urban blocks closest to shoreline, teams would be required to examine the metropolis’s gradient of edge zones and how water circulates within them; 21st century acqua alta city. a far less speculative Rising Currents, 2.0.